Nothing irks me more than seeing gum somewhere. 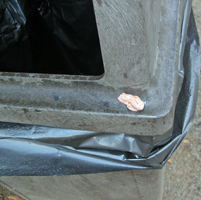 Someone stuck their gum to the side of this trash can at the Nashville Zoo at Grassmere. It’s disgusting to step in someone’s gum, as it’s impossible to get off the bottom of a shoe. I always seem to step in it while I’m wearing running shoes with waffled soles. Gum lasts forever as trash. Don’t use it. Don’t throw it outside. I’m contributing to nowpublic.com. I’ll be writing in the next few weeks about how to make the holidays more green. Here is a story from MSNBC.com about Christmas ornaments made from reindeer poop. 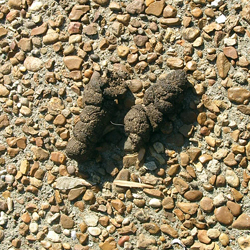 I’m not sure why poop is getting more notice on my blog these days. Yes, that’s dog poop on the sidewalk. I found it the other day when I was walking. Since it was aged, I kicked it to the grass along the sidewalk. Luckily, I was out during the day; sometimes, I walk at night in the neighborhood. I could have stepped in it. I have a dog, who often goes when we’re out walking. Plastic grocery bags are wonderful for scooping up the poop. Unfortunately, I send it to the landfill, but it’s better than stepping in it. If he didn’t eat meat products, I’d try to compost it. Please, clean up after your dog. This vegan is having turkeys for dinner (as guests) in this feature from the Los Angeles Times. We have a neighbor who has chickens for pets. Oops, don’t tell the Homeowners Association. Actually, the chickens eat all the bugs around the house. They do a better job at insect control, than my cats do as rodent cops. from The Earth Is Not a Trash Can. My blogging has been temporarily interrupted as I adapt to my new life style of looking for employment. While unemployed, I will be learning more about social media (soon to be announced) and I’m doing some contract work, along with receiving unemployment money. Although 2008 has had some bumps for us, my husband and I are very thankful for what we have that enriches our lives. Our debt is minimal, so the lack of regular paychecks is tolerable for a while. We never go out on Black Friday (the day after Thanksgiving) unless it is to work or to go see a movie. We don’t need another sweater, although John needs a new pair of walking shoes. We’re healthy. His parents, who were both extremely ill during Christmas of last year, are doing better. After stuffing the turkey tomorrow, then stuffing yourselves, go make the world a little more attractive by picking up a bag of litter along the roadways to your homes. Don’t toss out any trash during the holiday season. 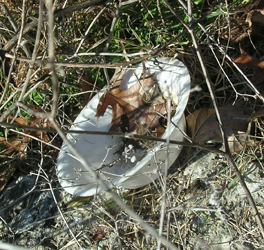 Celebrate Advent, Hannukah, the winter solstice or whatever you celebrate during the end of the year by picking up litter.